Fifty percent of the 270 billion customer service calls placed each year go unresolved, while 61% of those calls could have been resolved with better access to information. These are just two of the statistics presented by IBM when the company unveiled the Watson Engagement Advisor, a customer service solution, last May. At the same, Forrester Research reports that 40% of Gen-Y shoppers will abandon an online purchase if their questions aren’t answered quickly, while 60% also believe that valuing the consumer’s time is the most important thing a company can do to provide good online customer service. Companies like Australia’s ANZ Bank, Nielsen, Celcom, HIS and Royal Bank of Canada have already begun to use the Watson-based service to revolutionize interactions with their customers by providing personalized, fast and accurate communication via cognitive cloud-based computing. And with IBM reporting that Millennials will represent 48% of the workforce by 2020, many companies are adapting their ecommerce customer service solutions in order to keep up with the demands of this new generation of consumers. “Millennials don’t want to talk on the phone. It’s 2014. They don’t want to say, ‘Hi, my name is so-and-so,—’ and talk for 30 seconds before asking the real question. It’s too much overhead. They want to be able to go on a site and type very quickly, ‘Hi, I’m John Doe, what’s my order status?’ and boom, there’s the answer,”explains Brian Park, Co-founder and CEO of CallText, a customer relationship platform that allows for real-time communication between ecommerce SMBs and their customers. 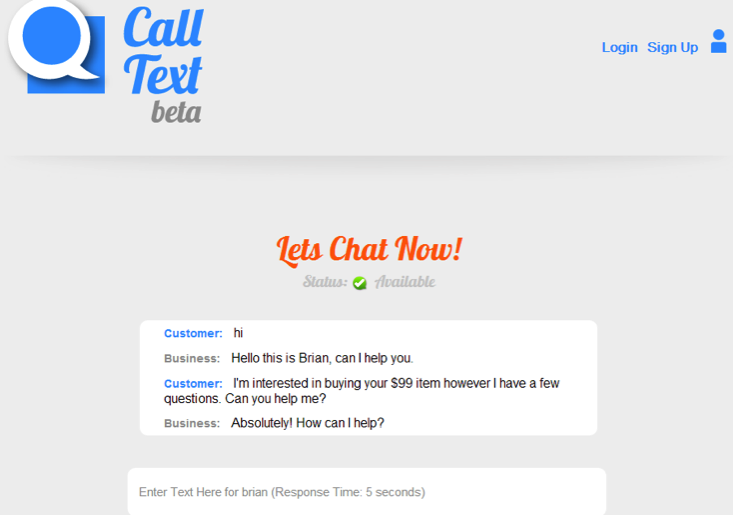 Similar to Watson, the patent-pending click-to-text technology behind CallText leverages the rising adoption of omni-channel retailing and the shifting social trend towards non-verbal communication to revolutionize the ecommerce-consumer relationship via web-based live chat, a simple user interface and smart artificial intelligence with instant feedback and SMS texting. With CallText, SMBs have a cloud-based, scalable approach to more effective customer service without taxing their financial resources, such as by hiring employees. “The ecommerce market is about $200 billion and the top 100 ecommerce vendors — the Walmarts and the Amazons — own 75%, or $150 billion, of this ecommerce space. What about the 94,000 businesses, which represent the other $50 billion? That’s the bottom of the funnel where nobody cares for them. But we care and that’s where CallText wants to be,” said Park. In less than 30 seconds, sellers can register their smartphones and receive their URLs, which can then be embedded anywhere on their websites. When clicked, the link will take customers to a chat box where they can type their questions. A smart auto response agent will provide a real-time answer in line with the instant feedback today’s ecommerce consumer has come to expect from their technology. “A customer can type, ‘What time do you close?’ The NLP [natural language processing] engine will look at the question and respond. ‘We close at 3pm,’ or, ‘These are our hours of operation,’” said Park. The question-and-answering system behind CallText gets its algorithm from SonnetOS — a question-action response system for multiple platforms that combined a graphical user interface with a natural language based macro-processing system – a previous project developed by CallText’s Co-founder and CTO, Nathaniel Cooper. The co-founders met at a pitching event in Washington D.C. two years ago and immediately saw a synergy between the algorithm behind SonnetOS and CallText’s mission. “When I first saw Nathaniel’s technology, my first reaction was, ‘This is like Watson. Wouldn’t it be cool to bring a Watson-like chatting solution to SMBs for customer support and their customers can’t tell if they are interfacing with a real person or a machine? This can really transform the customer experience of a $200 billion industry,’” said Park. No plug-ins or specialized software are required for either the seller or customers — just standard Internet browsers and SMS for smartphones. Once online merchants submit the top 10-20 FAQs about their products or services to CallText, they can start testing the natural language processing algorithm behind the smart auto response agent. “We did research to show that 80% of questions that customers ask over the phone are already indexed by the Internet. The first function of our algorithm is to filter out those easy questions so that the seller doesn’t have to get involved in the transaction,” said Cooper. For the 20% of questions that the NLP engine can’t automatically answer, inquiries will be sent by SMS to the emerchant’s smartphone, which allows sellers to engage with their customers regardless of whether or not they’re in front of their computers. “Our customers can respond appropriately in real time and the conversation is actually seamless, from their perspective,” adds Cooper. Sellers can register multiple smartphones to the account, such as in the case of small businesses where there might be three managers overseeing three different shifts, in order to ensure that the website is continuously monitored. Smart routing directs messages to the appropriate person. Messages are cascaded after a certain time to multiple responders to ensure prompt answers to questions. If, by chance, there’s still no response, the chat window will come back to the customer and tell them to leave their contact information. Because the smart auto agent takes on a large portion of SMBs’ customer support responsibilities, sellers and employees can focus their time and attention on the sales process. “A lot of our customers really like the hybrid approach of allowing the smart auto responder to handle the very simple customer support questions, but then having the ability to take over when it’s a sales lead from anywhere anytime,” explains Park. The engagement and product promotion that cloud-based solutions like CallText and Watson can create is something Park has seen at the Washington D.C. Chapter of Startup Grind, where he is the chapter director. “Before people hit ‘buy’ on the site and sign-up for a yearly membership at $100 a year, they want to feel that their money is being ‘earned’ on the other side of the website. So I need to engage real time with prospects and make them into customers. It’s on me to make that sale happen now. I’ve gotten a 60-70% purchase hit rate from the people who interface with me or Derek [Startup Grind’s founder],” said Park. And this shift towards implementing cloud-delivered, cognitive ecommerce solutions as a way of connecting with today’s tech-savvy consumer is only getting stronger. IBM recently announced the creation of the IBM Watson Group — a $1 billion Watson-centric division led by Senior Vice President Michael Rhodin and headquartered in the heart of Silicon Alley, which aims to disrupt markets such as financial services, retail, travel, telecommunications and healthcare by accelerating the adoption of Watson cognitive technologies. The Group already has 2,000 employees working to develop and design new cloud-based cognitive computing software, apps and services. Part of IBM’s billion-dollar investment will include $100 million reserved to help startups and businesses developing cognitive apps that are fueled by the Watson Developer Cloud. Currently, CallText is working on refining its NLP algorithm, building out its API library and is in talks with several aggregators interested in using the solution. And the bootstrapped beta company intends on applying to IBM Watson’s new fund.